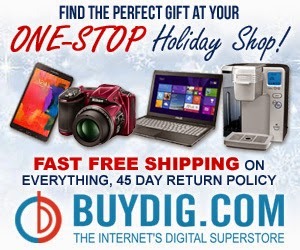 If you're looking to upgrade, or replace electronics in your home, or purchase gifts for your loved ones, BuyDig.com is THE place to shop for quality products including computers, cameras, and top notch televisions--- all at rock bottom prices. They carry all of the top major brands including LG, Samsung, and Canon. Check out my full review of the LG 42-inch 1080p Direct SMART HDTV with Wi-Fi. With BuyDig.com you don't have to wait for Black Friday or Cyber Monday deals to get amazing prices because you won't find a better deal anywhere else! HAPS1/B 500GB Hi-Res Music Player System - Silver.